Distance to bus stop about 300 meters by bus to Slussen / Stockholm. 3 Fireplaces, Room Distribution; Floor 1 = Large hall, large kitchen, large bathroom with toilet, large living room with fireplace, 3 bedrooms, utility room, conservatory m. M.
Floor 2 = 3 bedrooms, living room / library, balcony, WC, shower. 12 Bicycles and motorboat are included in the rent, including a lot of toys and fish dunes. The large bathroom has a large corner bath, shower and toilet. 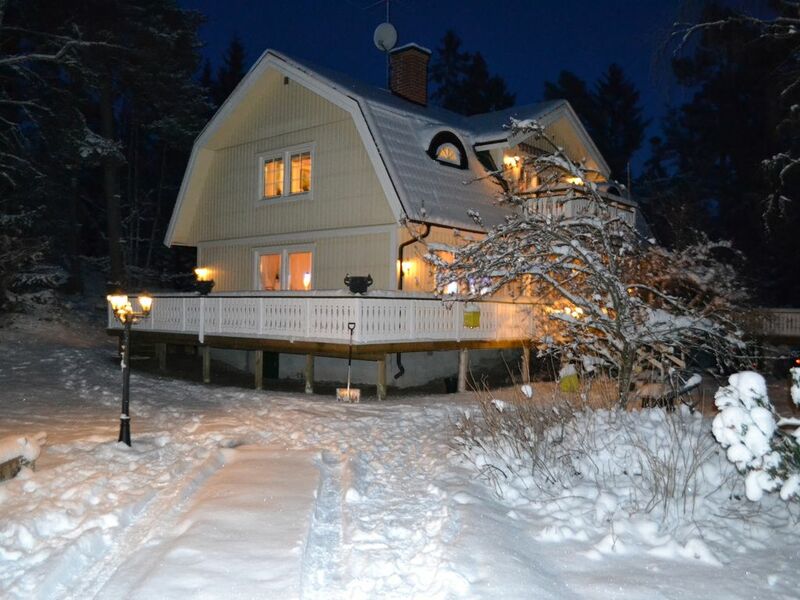 ¤ 300 meters to sea by boat, children's pool, fishing m. M.
¤ 300 meters to bus stop with direct bus to / from Slussen (approx. 1 h) By car approx 45 min. ¤ 700 meters to lake with children's pool, jetty, fishing m.
The house includes everything for rent weekly or single days / weekends all but more! Ground rent 24900: - / Week or as per! Small bathroom with shower tiled walls of glass, and the toilet seat. Large bathroom with corner bath, shower and toilet, fully tiled. Car and motorcycle 125cc can be rented for an extra as well it is possible to get a private chef at additional cost. A larger boat is also available at additional cost. Most things can be arranged! Very nice property and very friendly owner! Lennart was very easy to communicate with and prepared everything for us in the house. My friends and I had a wonderful time! The house is very nice, huge terrace, fully-equipped, etc. I would definitely recommend staying there! Thank you Sophie & Co for letting us host you! And for leaving the house so clean and tidy! You and all your friends are always welcome back! We were a group of friends staying over for the weekend in middle of december. We found the house with all lights on when we arrived at night, which was a very nice welcome. Bedsheets have additional fees, they were folded on a table on first floor and we could pick them up according to quantity desired. The kitchen was equipped with all cleaning liquids we may need and there were a lot of wood piles stored outside with a big amount of newspaper and fire crackers to light up the sauna. There are also a lot of board games in the home, and one thing I particularly appreciated is the numerous options to sit in group. Many terrasses and even the first floor has a mini living room between the bedrooms. We really enjoyed our time and Lennart was easy to communicate with. There is a bus departing every 3 hours from Slussen (Central Stockholm) stopping in Jessens Backe and then it is a 10 minutes walk across the woods to get to the house. Don't forget a torch light if you plan on arriving at night. You and your friends are allways welcome back! Für den hohen Preis enttäuschend! Das Haus würde sicher mehr Sterne von uns erhalten, wenn das was versprochen und beschrieben wird, auch dort gewesen wäre. Von den angegebenen Booten keine Spur, Wlan ist noch nicht einmal.verlegt - und der Fitnessraum ist eine Ansammlung von alten, rostigen Geräten in einer Ecke auf der Terrasse. Wir sind während unseres 3-wöchigen Aufenthalts vom Vermieter vertröstet worden - meistens jedoch ignoriert. Die Lage ist ruhig und das Haus geräumig - leider den Mietpreis nicht wert. unfortunatly this guest was the worst ever!!! Anyway you are always welcome back! Vi hyrde huset en natt för att avsluta en möhippa på ett mysigt ställe. Huset låg avskilt och det fanns gott om bra sovplayser varför det var perfekt för oss. Vi uppskattade att det fanns bastu och stort uterum samt altan. Lennart var en mycket bra värd och lätt att ha att göra med. Kan absolut rekommendera andra att hyra huset. Here we find a very nice villa in country house style with a fantastic quiet and quite unabashedly location as the last house on the private road! The house is located near havsvik (300 m) by motorboat, children's pool, sandy beach and fishing. Several lakes are also within walking distance about 700 meters. About 12 bikes are included in the rent! Child Safe Area = No cars, no noise. Fully equipped house with everything, Approximately 350 sqm sun deck around the house. Balcony, Sauna, superb fishing in a scenic archipelago area! Near about 3 km to the restaurant and serving food, near the large seaside resort with sandy beaches, cliffs and diving tower, about 1500 meters. Ferries for day trips m. M. At about 4 km distance. Motorboat is available for rent. Lakan, örngott samt handdukar går att hyra för 100:- / Vecka. Slutstädning tillkommer a 1900 sek.